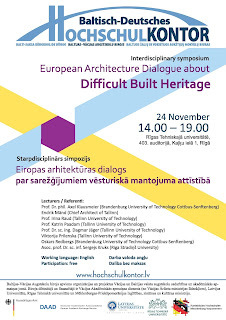 Interdisciplinary German-Baltic Symposium on strategies of transforming existing and neglected buildings, ensembles or urban environments of the younger history. „How to maintain & transform difficult (young or political) built heritage to unfold vivid places of multifaceted architectural design, of materialized culture layering history with respect? How to enable collective memory in the contemporary re-programming of the sites? How to convey to meaning, relevance and subtlety of continuity consecrated in the materiality of cities to the ever diverse audiences?“. 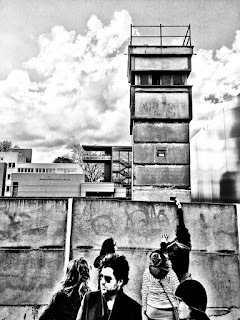 Rescuing difficult heritage - The Berlin Wall example. From civic commitment to a stately funded commemoration institution. Endrik Mänd, Architect & Urban Planner, Chief Architect of Tallinn: Survival of Symbols. Prof. Irina Raud, Architect & Director of Department of Architecture & Urban Design, Tallinn University of Technology: Rotermanni district in Tallinn. 30 years value development of an inner city ensemble. Viktorija Prilenska, Architect, Urban Planner & Designer, PhD Candidate at Tallinn University of Technology: Consensus building between stakeholders with conflicting interests. Learning from Kalaranna & Mezaparks. Prof. Dr. Katrin Paadam, Sociologist, Chair of Sociology, Tallinn University of Technology: Between inevitability and dreams – citizens’ perspectives on urban spatial realities. Prof. Dr. Sergei Kruk, Communication Scientist, Professor of Media, Stradina University: Continuous semiosis of the contested past: Political monuments as art, technology and ideology. Oskars Redbergs, Architect & Curator, Hilbig Institute Riga & Brandenburg University of Technology, Cottbus: Propaganda and the city. Narratives and structures. Transformations in the historic centre of Riga. 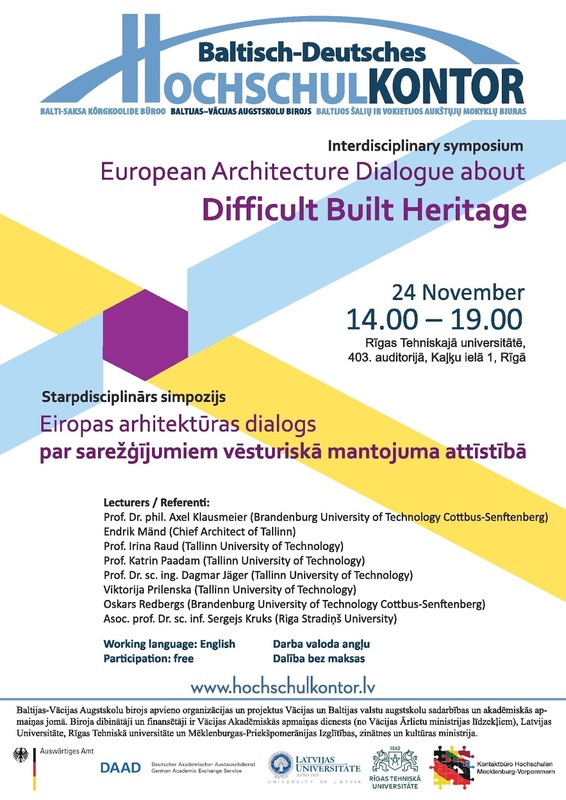 Prof. Dr. Dagmar Jäger, Architect & Author, Programme Director of European Architecture, Tallinn University of Technology: A European Discourse about the Re-invention of Traditions – Translation by re-programming of 3 historic prison’s plots of the 19th century. Discussion with all lecturers and concluding summary, with Prof. Dr. Katrin Paadam. ArchitecTour Riga with Oskars Redbergs, Hilbig Institute Riga. The meeting point will be announced at the end of the colloquium. Since January 2009, Axel Klausmeier is the Director of the Berlin Wall Foundation. His work and research focuses on “difficult and uncomfortable heritage” and how politically tainted building legacies are handled and discussed. During his years as Assistant professor at the department of architectural conservation at the Brandenburg University of Technology Cottbus, he documented the remnants and traces of the Berlin Wall, together with Leo Schmidt until 2004, a project commissioned by the Berlin Senate. He is honorary professor for historic cultural landscapes and landscapes of memory and published numerous books and articles, among them are Re-mapping the field: New Approaches in Conflict Archaeology, Berlin 2006 and more recently "The Berlin Wall"-Exhibition catalogue of the Berlin Wall Memorial, Berlin 2015. The Chief Architect’s main areas of responsibility in today’s rapidly changing social and economical landscape is to reduce the influence of urban sprawl and stand for improvement of multifunctional urban space in Tallinn in order to make the city an attractive living place for different social groups. For the last 6 years strong emphasis has been put to completion of several comprehensive and thematic plans of Tallinn. Since 1998, E. Mänd has been working on different posts in the Tallinn Urban Planning Department, including the regional architect for Nõmme and City Center districts, director of Comprehensive Planning Office and since 2007 he is the Chief Architect of the City of Tallinn. In 1992, I. Raud founded the Architecture Studio R-KONSULT and is member of the Estonian Union of Architects, since 1993 correspondent member of the German Academy of Urban Construction and Planning, and member of the German Academy of Arts in Berlin since 1996. Since more than 4 decades, I. Raud has been planning large cultural or business venues such as Ugala Theatre and compiled a number of urban planning projects. Both, in creative work as well as teaching, Irina Raud gives great importance on specific analysis of the site, taking into account the influence of the existing space and structures, the connectivity of the organic with the urban landscape. From 2014 until now Viktorija is a PhD student at Tallinn University of Technology. In 2012 Viktorija has graduated from Delft University of Technology with a Master of Science degree in Urbanism. In 2009 Viktorija was granted a Diploma in Architecture from Riga Technical University. Apart from the studies, Viktorija worked at architecture offices "KUBS" and "SZK", planning office "METRUM" and Riga City Council Planning Office. In her PhD Viktorija is developing a design game, which is expected to facilitate consensus building between stakeholders with conflicting interests during the design of a detailed plan. Katrin Paadam, Dr. Professor of Sociology, Tallinn University of Technology. K. Paadam is the Head of the Group of Urban and Residential Studies with recent research on processes of urban and residential renewal, gentrification, conversion of industrial heritage spaces, transforming residential and public spaces and Tallinn waterfront development as negotiated by different actor groups. She is currently an expert in the project ‘Tallinn Main Street’ (Estonian Centre of Architecture). Her interest in the symbolic exchange between the material and the social in urban evolvement has underlined her interdisciplinary inclinations in teaching and research in local, EU, Nordic or other international programmes, found in publications as also in the latest 2016 joint-edited (with S. Gromark, M. Ilmonen, E. Støa) and (co) authored 'Ways of Residing in Transformation. Interdisciplinary Perspectives' by Ashgate/Routledge. Sergei Kruk holds a doctoral degree in communication sciences from the Université Paris-II. Currently, at the Riga Stradiņš University he teaches semiotics and discourse analysis. Among his research interests are the Soviet and post-Soviet concepts of sign and communication. In Latvian, Kruk has published books ‘For the beautiful and melodic music!’ The Soviet cultural politicy, 1932-1964 (2008) and Semiotics, economics and politics of outdoor sculpture (2011). In English, he has published articles on Soviet/Latvia cultural policy and semiotics in Social Semiotics, Journal of Baltic Studies, Revue Belge de Philologie et Histoire, Visual Communication, Journal of Folklore Research. Oskars Redbergs is an architect, educator and curator. His main research focus is on the transformation of urban landscape of post-socialist, post-colonial cities. Currently he is a researcher at Brandenburg University of Technology where his research focus is on ‘Transformation Projects of Historic Urban Structure and Architecture in the Historic Centre of Riga Territory of the World Heritage Site, since 1997’. Oskars Redbergs is the founder of The Hilbig Institute in Riga and Megaphone Publishers. In 2011 he was appointed as a curator for the European Cultural Days of the European Central Bank (ECB) – Latvia (2013). The research has resulted in the large-scale traveling Architecture exhibition, shown in cities of Frankfurt, Riga and Tallinn, published in the book under the same title: ‘9 Conditions of Riga: Regeneration and Transformation of the City – Urban Environment and Architecture’.